The Twin in Berlin: I Have Endured And Yes Enjoyed So Many Long, Hard, Weary Weeks In Lübeck. I Have Endured And Yes Enjoyed So Many Long, Hard, Weary Weeks In Lübeck. BUT ALAS on to the good stuff. SO. Wednesday we had our district meeting. I gave a theme on making a personal study plan. Then later Sister Brim and I went to Oldenburg up in Holst, to visit a member and to do some dooring there. While there elder Peterson called and asked if we wanted to baptize a family. NA KLAR. Apparently a lady had called the church, and a member there cleaning was able to get her information. He gave it to the Elders as she is a woman, the elders thought it made more sense and would be easier for us to get a hold of her. So I called her up, had a solid conversation, and made an appt for the next day. THURSDAY we go check out the scene. So Frau Devers has been here in Lübeck since August, before she was in Bremen. She had a friend there who told her much about the church, and at one point she even was meeting with missionaries. So she knows a lot. But back then she had many doubts and wasn't totally on board. She said it took three years for her to really develop the desire to move forward. As we were sitting there amongst the chaos of her kids in the background it was just so coooool and aaawweeesome to see how perceptive she is to the spirit. She told us that she was really proud of herself that she had called us, and that we were there sitting across from her. WUNDER WUNDER WUNDER. As we gave simple testimony of the truthfulness of the restored Gospel, it was tender to see her start crying and glow with the spirit. OH MAN IT WAS AWESEOME. So she said she was coming to church and would bring her supportive but not interested husband. Sure enough on Sunday there she was!! She really liked it. In FHV (Relief Society) the lesson was all on gaining a testimony of the book of Mormon, haha THANK YOU lieber Vater im Himmel! SO we went over this morning, planning to invite her to baptism. Sister Brim and I had prayed about the 9th of May, and we were just stoooked to invite her. We went through the restoration again, and talked about the feelings she is experiencing right now. She feeels the spirit so strongly and is so open. I cannot tell you how much of a miracle it is. Here's where it gets good. We told her how ready we could see she is, and then asked if she would prepare to be baptized on the 9th of May. She had already told us that she was planning on getting baptized right before then, and then we knew it was time to pull out a date. So at first she looked a little shocked and said, next month?! haha we just nodded excitedly. na klar!! Then she just kept going, well...yes. I mean, ok. Yes. haha she then said that at first she was surprised but the more she thought about it, she can feel that it is right. HERRLICHER TAG. WUNDER. MIRACLE: ALL OF THE ABOVE. naja. We were all just so stoked. Then she said that her husband actually wanted to talk with us, and asked if we would come over in the evening time so he could be there too. AND SO IT GOES. So we are going over for abendbrot wednesday night. Sister Brim and I walked outta there just overjoyed. We were just so happy and had to stop in the middle of the street to thank Heavenly Father for that miracle. SO MUCH has happened in little Lübeck in the past 4 days! The Lord's ways are totally unpredictable but perfect. He has a plan. How grateful am I to have stayed here in Lübeck another transfer. Woooooow how to come down from that dream. I honestly don't think I have ever been so happy. Seriously, I have endured and yes enjoyed so many long, hard, weary weeks in Lübeck. But this past week has made it all so worth it. I wish I could tell you exactly how I feel. Alma 26:16 rings true. Well. Sister Brim and I are doing well. She is hilarious and I looove her. Thanks for all the pics of Utah!!! How funn!!! But where are all the pics of the new house!!! I wannnna seeee!!!! Glad you had fun!! Can’t wait to join you next time yo. 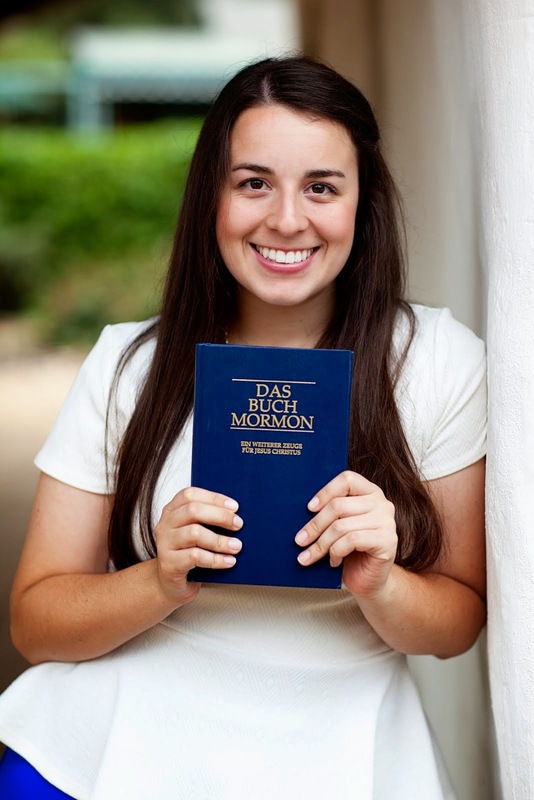 Sister Murdock is in Leipzig...guess who her district leader is..... Elder Clarke!! How fun is that! Next week we have a mission conference in Berlin, so I will get to see all of my missionary friends. Super stoked. So Innenstadt will be all "locked up" for the next few days with this whole G7 thing, there are lots of police people everywhere, we are supposed to be extra cautious. Sister Brim and I are curious and excited to see what all happens. Don’t worry we will be safe and follow the spirit! Well! Again I wish I could tell you all how heavenly life is! I love being a missionary so much. I love Germany, I love the people here. I love giving this part of my life to the Lord. I love this city. I know this is where I am supposed to be. This past week has really just been a huge tender mercy for me. God is real. Through the Savior everything is possible. His pure Gospel and church have been restored to the earth. I know it! I love you. Have the best week!